Being a vibrant city, Singapore has definitely one of the liveliest nightlife in the region. From chill out drinking to romantic evening date, we’ve got the best rooftop bars in Singapore for you to not only enjoy the company of your date but also the view. Located at The Fullerton Bay Hotel, Lantern allows you to have an unobstructed view across the Marina Bay, with the iconic Marina Bay Sands in the background as you enjoy the evening. Lay back literally at their bed-style seating, perfect for those who want to get up-close and personal to each other. While The Fullerton may not be the highest rooftop bar in Singapore, but most definitely worth your time. Surrounded by various buildings in the CBD, Hi-So Rooftop bar doesn’t boast the prettiest rooftop view, but it does have a swimming pool that you can go in for a dip during the day. The garden theme and open-air terrace also give the whole place a cozy feel. One of the highest rooftop bar in Singapore, Stellar at 1-Altitude is definitely one not to be missed. This fact alone is good enough a reason to visit here at least once. At the 63th storey of One Raffles Place, other accompanying concepts include a viewing gallery, café and a VIP members club. With more than having a stunning view of Marina Bay Sands, LeVeL33 is also the world’s highest urban microbrewery. Enjoy the view alongside a selection of craft beers, from pale ales to dark stouts, which focuses on quality. The food menu is equally stunning; a fine array of gourmet-style beer snacks such as wings and baby ribs. 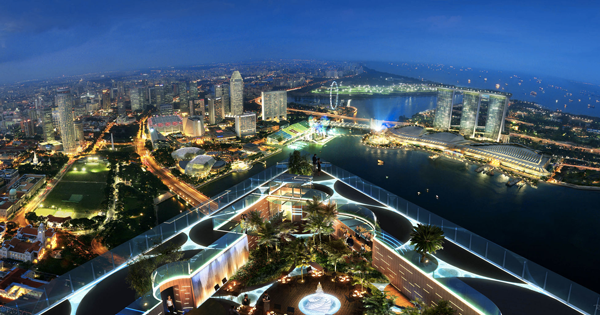 Why pay the entry fee to Marina Bay Sands’ SkyPark Observation Deck when you can enjoy free entrance to Ce La Vi. On top of that, order up some cocktails and chill out at the lounge or poolside terrace. It’s all about being luxurious and glamourous. #LetsGetSocial tonight! Flash your mobile phone at the door and show that you’re already a fan of CÉ LA VI Singapore on Facebook or Instagram to enjoy complimentary entry and one premium pour till 1am. Grab instant pictures at the mirror photobooth with your party posse or go wild on the dance floor with two of our special mascots. This is a Saturday dedicated to the superfans. Probably the most unique rooftop bar in Singapore, Supertree by Indochine allows you to feel what it’s like to be on top of a tree, giving you the impressive bird’s eye view across Gardens by the Bay. Enjoy all sorts of drinks as well as a food menu comprising Asian and western delights. Having several awards under its belt, the gorgeous view at New Asia Bar is accompanied by the early opening hours, giving you the chance to catch the sun sets. Catch various celebrity DJs on certain evenings, which turns the place into a party nightspot. Urban setting with a Japanese theme, even the menu has a touch of Japan. Enjoy beers and cocktails alongside sushi and sashimi, giving you a unique and luxurious Japanese nightlife experience. Similar to a few other rooftop bars, you get to enjoy the view of Marina Bay Sands from the roof of Customs House as well. Among the coziest rooftop restaurants in Singapore, Mr Punch is located on the top of Mint Museum of Toys. Vintage and retro furnishings complete with affordable drinks and food menu. Bars with a view are plenty on the island, but we find that the vibes here at the Mint Museum are unchallenged – one of our go-to places for a chill-out evening. Good food at a good place with a good atmosphere ?